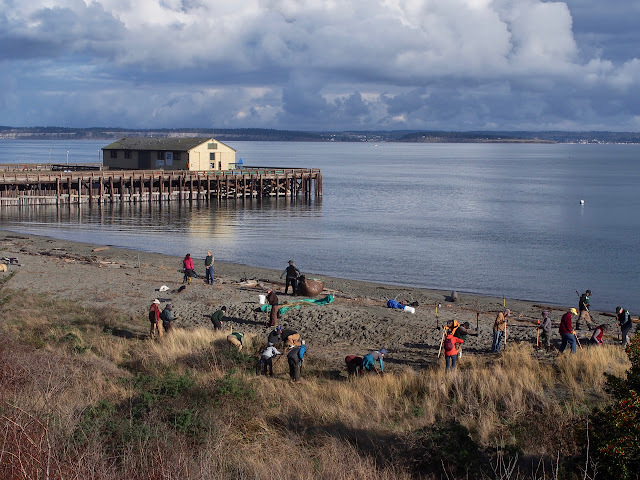 Every year, we join forces with other local organizations like the Native Plant Society and the Friends of Fort Worden to discuss which area of Fort Worden State Park and species of invasive weed should be targeted. Once that is decided, the parks staff helps by providing transportation and disposal of the organic waste. Local high school students involved in the Youth Environmental Stewards program. Monday, Jan. 21 was a lovely breeze-less day, with the sun even making an appearance, peeking out from behind the clouds. We had an amazing turn out of PTMSC and FFW volunteers, as well as many first timers. 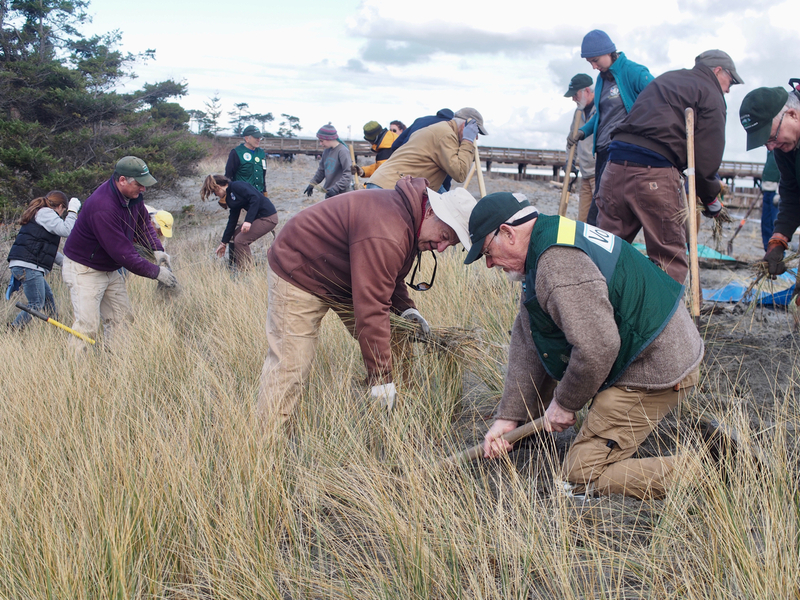 More than 40 individuals offered up their time. 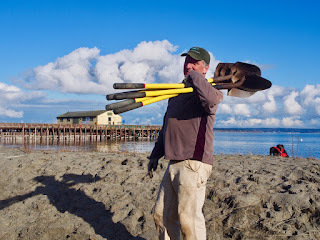 Doug Rogers, excited to be done and cleaning up tools in the beautiful sunshine. 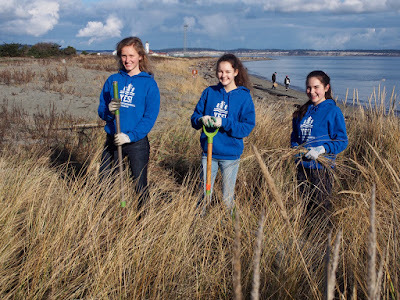 As a group, we conquered two large zones of invasive beach grass (ammophila) that have been present for many years. Each year the size of the patch gets smaller and smaller. With the intensity of our volunteers this year, we were able to completely clear the zone on the south side of the pier. It was a sight to see! Volunteers tackling the dune grass patch near our pier. An event like this also provided the opportunity for public education. Several times we were questioned by individuals on what we were doing or why we were “making more beach.” We were able to educate people on the problem with invasive species in our environment. In addition, we explained how removing invasive plants provides native plants and the natural landscape the opportunity to flourish again. It was remarkable to see the willingness of everyone who came out that day to get down in the sand and dig. I am constantly amazed by the talent and dedication of this community. Thank you to the many organizations involved (see above) for their collaboration. 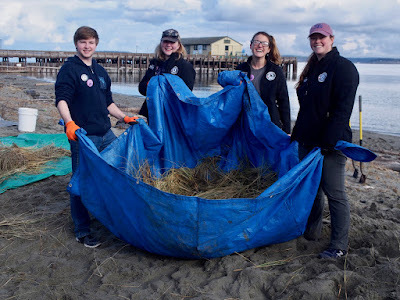 It takes a team to tackle projects like this and it wouldn’t have turned out nearly as well as it did without their help and the amazing volunteers who turned out for the event! Written by Mandi Johnson, Americorps Volunteer Program Educator.